1) New music: Their fourth studio album, Washed Away, was released in May of 2016. The first singles were “My Heart Beats 4 U” and “Why”, and are definitely sunny, Weezeresque songs. 2) Cool name reference: Named after Ed Rooney (shortened to Rooney), who was the principal in Ferris Bueller’s Day Off. 3) Nostalgia factor: If you remember the old songs, come for the new. 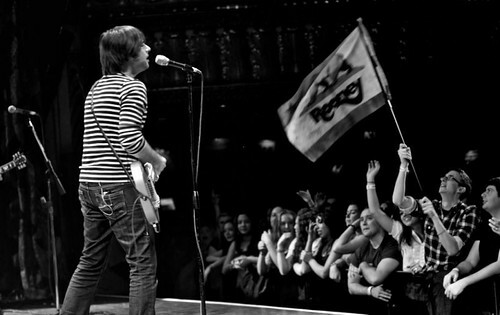 In 2016 after a hiatus, they re-formed as a new version of the band (with a new line-up), led by the only original member Robert Schwartzman (lead vocals). 4) Influences: Their sound has been noted with hints of the British rock and 1980’s pop, with comparisons to The Cars, Queen and The Beatles thrown in for good measure in their early years. Maybe a dash of Weezer with their new album. Get your tickets for July 8th here. Tickets are $20. Doors open at the Rock and Roll Hotel at 7pm. Show at 8pm. Opener is Run River North.